We select Miami as the city that best meets our vacation needs. It provides a necessary respite from the cold and is gaining ground as a culinary hot spot. Also notable are neighborhoods with clusters of kosher restaurants, some of which are moving beyond tradition and pushing boundaries with their food. We divide and conquer as many restaurants as we can in five days, with Will Smith’s “Welcome to Miami” the soundtrack to our retreat. Noma stands for North of Miami. It should not be confused with the world-famous restaurant in Copenhagen, although the kosher dairy restaurant in Aventura does skew Scandinavian in its decor. The menu takes inspiration from pretty much everywhere. Dishes run the gamut from Middle Eastern to Vietnamese, Mexican, Japanese, and Italian. We slide into South Florida vacation mode with tempura fried mahi-mahi tacos brightened with seaweed salad and spicy mayo. The pizzas at Noma have pizzazz. House made dough is made crisp in their brick oven. Brûléed pear with ricotta, caramelized onions, pears, and balsamic reduction is a standout combination of sweet and savory. 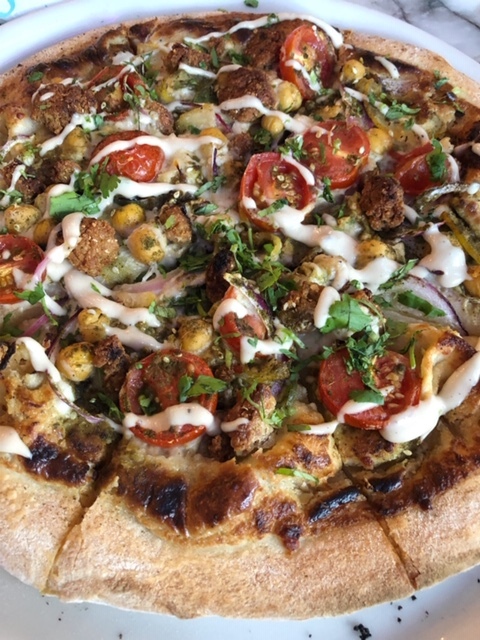 The Mediterranean washes over a pizza topped with tahini, falafel crumble, chickpeas, feta, zaatar, chili and preserved lemon. Greek salad is amply portioned and brimming with fresh ingredients. Noma is relatively new – it opened in early 2018. It’s the “Welcome to Miami!” we’re hoping for and happy to receive. It’s unusual to find a kosher restaurant on a city’s list of hot restaurants. But Plant Miami isn’t like most kosher restaurants. It is first and foremost a vegan restaurant in the mural-heavy Wynwood section of Miami. The restaurant is set back in a beautiful courtyard that is part of a holistic health and wellness destination known as The Sacred Space. We plant ourselves at a table on the patio and soak in views of a reflecting pond and meditation garden. James Beard Semi-Finalist Chef Horacio Rivadero and his spouse, pastry chef Veronica Manolizi, have created a potpourri of refined dishes. The seasonal vegetable-focused meal is as beautiful as it is bursting with flavor. 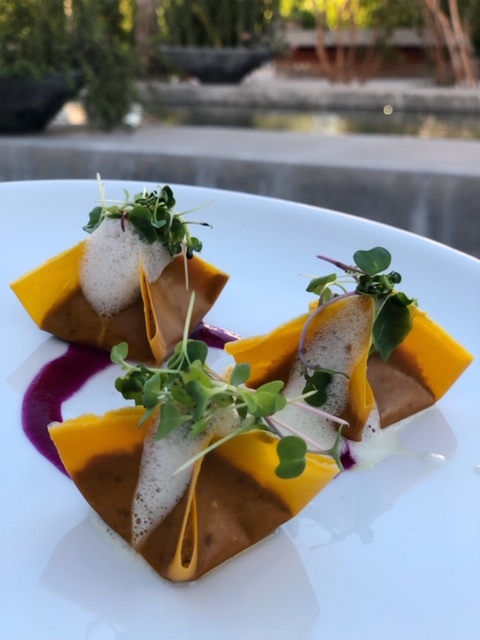 Sweet potato dumplings in a coconut wrapper are topped with ginger foam and micro-greens. They beg to be photographed, and then devoured. Ropa Vieja is typically a Cuban stew made from shredded pork or beef. The Plant version is created from sous vide mushrooms, with cauliflower congi substituting for rice and beans. The dish is gussied up with cilantro flowers. Tacos al pastor is a zippy blend of jackfruit with pepitas, pico de gallo, lime crema avocado, and pineapple. The food at Plant shines with many ingredients, including edible flowers and herbs, fresh off of owner Karla Dascal’s Paradise Farm. I really dig this plant-based restaurant. Zak Stern is a James Beard semi-finalist. His bakery/café in the Wynwood area of Miami is my happy place. It’s not to be missed as a destination for breakfast or lunch. I’m besotted by Stern’s avocado toast- a smash of avocado topped with crumbled feta and red pepper flakes on sourdough multigrain bread. A solid competitor for my affection is nova lox with whipped cream cheese and scallions atop sourdough country wheat bread. If you are here, it’s likely for the baked goods, but a salad of fresh vegetables, feta cheese, olives, herbs, and lemon vinaigrette is well worth taking a momentary break from carbs. I depart Zak the Baker with a bag stuffed to the brim with loaves of bread, the most sublime chocolate caramel pie, flaky croissants, flourless chocolate cookies, rugelach, a blueberry danish…and no regrets. We visit this small, bustling kosher café in Miami Beach for breakfast. First order of business, narrowing down options from an overwhelming menu including Greek and Spanish omelettes, breakfast burritos, egg wraps, shakshuka, pancakes, and French toast. There’s more, but you get the idea. This is the place to indulge. Go wild with Animal Style Breakfast Potatoes. Chopped potatoes are smothered in caramelized onions, grilled peppers, mushrooms, cheese, chives, and a thick and spicy sauce. Go sweet with Oreo Cookies and Cream Pancakes or Fruity Pebbles Pancakes. Or really feel the burn with Miami Heat Egg Wrap- a challah wrap filled with scrambled eggs, sriracha, jalapenos, caramelized onions, and pepper jack cheese. The restaurants that follow are not kosher. My extensive research on Miami/Miami Beach restaurants puts taqueria Taquiza on my to do list, but I’m not sure how to fit it into my itinerary. We’re relaxing on the beach and the thought bubble over where to eat lunch begins to appear over my head. I decide to prioritize convenience. Then I overhear someone raving about the tacos at a restaurant situated just behind us. Can it be Taquiza? It is! Destiny calls and I race towards it. Taquiza is the perfect spot to take a break from the sun. Handmade corn tortillas envelop well-seasoned proteins and their trimmings. There’s achiote marinated pork shoulder with char-grilled pineapple, chorizo with a blend of chiles, lengua (beef tongue) braised in beer, and shredded chicken in a spring onion salsa verde. Looking for authenticity in your Mexican food? Chapulines- toasted adobo-seasoned grasshoppers on guacamole- fits the bill. Elote (grilled corn) is thickly coated with a lavish mash-up of cilantro-jalapeno crema and cotija cheese. The food at Taquiza drips with messy deliciousness. It’s fortuitous then, that a dip in the ocean is just steps away. Kyu is a Wynwood hotspot. It’s boisterous, fun, and on trend with an emphasis on Asian-inspired dishes prepared in a wood-fired grill. The menu divides into sections of Snacky Snacks, Fresh & Bright, Crispy, Crunchy, Chilled & Refreshing, Smoked, Veggies, and Wood Fired. Chef Michael Lewis takes his fine dining training (Le Bernardin, Bouley, and Jean-Georges) and applies it here with simple finesse. His strategy is to take a few quality ingredients and let them shine. The chef is a char-master. The roasted and deeply charred cauliflower atop goat cheese and a feisty herb vinaigrette does the “fresh and bright” side of the menu proud. The flavor of wood-fired Japanese sweet potato infused with white miso, parmesan cheese, and crispy black sugar topping is still seared into my memory. Plus there’s crisp toast to slather with burrata and yuzu marmalade. Kyu – as our server reminds us- is about sharing. This concept is not always workable for me when I’m the only meat-eater at the table. I ignore my dining companions (sorry family) and order one of the restaurant’s signature dishes, Korean-style double fried chicken. The crispy and juicy poultry is finished on the wood-fired grill and set to rest on a slick sauce composed of butter, sriracha and gochujang chili paste. More heat comes in the form of braised spinach with red chili butter. Looking for something fishy? Florida red snapper with brown butter and white miso serves to further ignite our enthusiasm for Kyu. Stubborn Seed oozes with cool and casual elegance and sophistication. It’s probably not the best place to visit with a 10-month old baby, but a quote by Chef/Owner Jeremy Ford propels us forward. Says the “Top Chef” Season 13 winner: “We have to be Stubborn in what we believe in.” And my family firmly believes in the pursuit of great restaurants, even when it’s not necessarily practical. Like Kyu’s Michael Lewis, Ford has worked alongside famed French chef Jean-Georges Vongerichten. In fact, Vongerichten played a role in Ford’s “Top Chef” win, serving as his sous chef in the finale. While Lewis embraces the playful side of cooking, Ford’s food is more serious and dramatic. Dinner commences with an explanation from our server. “We do things differently here. Dishes are meant to be shared, and they come out as they are ready.” Where have we heard this before? Pretty much everywhere. The savory menu is divided into two parts- rooted/raw and sea/land. If we’re annoyed by the introduction, those feelings dissipate at our first tastes of Ford’s exquisite food. This begins with warm rolls accompanied by garbanzo and chili dip and continues through most of the seafood and vegetable dishes on the menu. Butter poached lobster is surrounded by green curry, carmelized cauliflower and crispy garlic. Jo-Jo tea cured cobia swims in spicy celery broth and a side of honeycrisp apple and compressed radish and fennel. 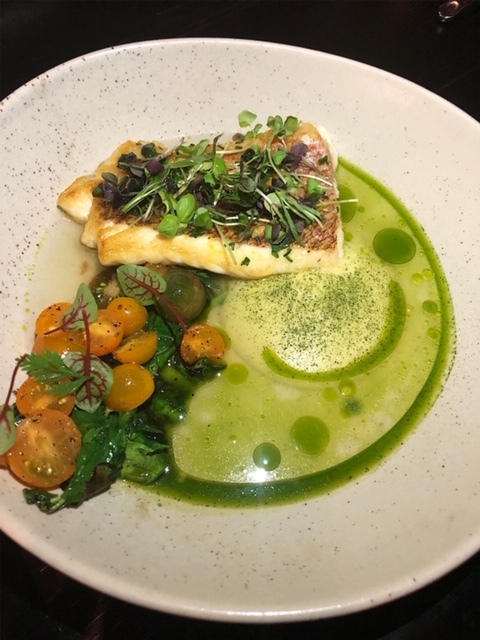 Thyme roasted red snapper gets dressed up with local tomatoes, lemon garlic puree and basil kombu broth. 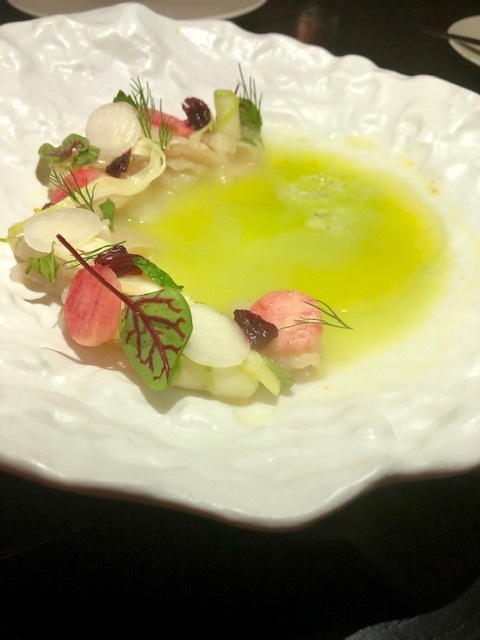 While the portions are modest, each bite is rich and bold and reflect the chef’s keen attention to detail. We order Simple Greens to balance out our meal. The fresh-off-the-farm greens are garnished with aged parmesan, herbs and Meyer lemon. When a “simple” salad tastes this complex, it’s an unanticipated pleasure. Entrees at Stubborn Seed range from the mid $30’s and up, with lobster topping out at $48. A Chef’s 5 Course Surprise Menu for $85 or 8 courses for $125 would be well worth it. It’s not the right time for us, with one of my infant granddaughters at the table. She eventually falls asleep, giving us time to to enjoy our meal and validating our steadfast commitment to dining at Stubborn Seed. 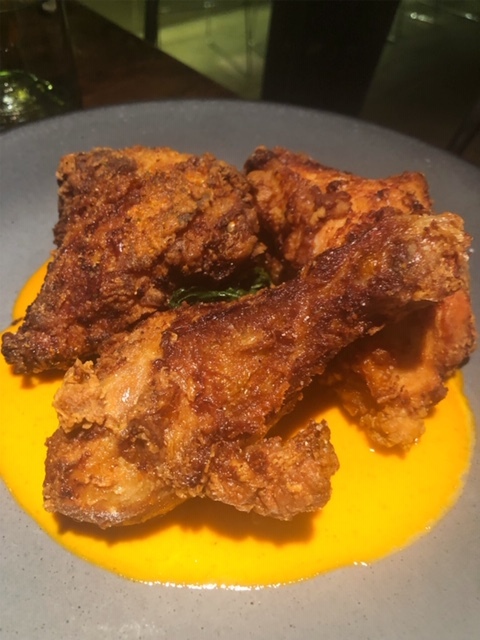 The Harbour Bistro, (kosher, meat) A casual bistro with creative kosher cuisine including duck foie gras, Korean style crispy chicken and scallion waffles, charcuterie, ramen, and housemade gyoza and bao.